Hi I am Lad. I work at the Red Bar at Bam Bou, London. The dream of my mum, was that I would become a pharmacist like her. I loved to stay with her in the shop and see her help and listen to people who really needed her. So people came to see her because of that and I naturally thought it would be my job too. But when I was 12-13 years old, my mum told me I was very good at communicating with people, she saw I liked to talk a lot and so she put me through a hotel academy where I started to play volleyball at a hight level. Then I had two dreams. One was working in hospitality and the other, to become a professional player. When I was 17 years old I travelled to France during the summer and I met local people, learnt their habits, ate their food and enjoyed their drinks, their way of life. I did it three summers in a row. But I couldn’t do both, so my mum told me I had to choose, between travelling the world or going to the university. So I went to university, playing volleyball but was injured, so life decided for me in the end. I decided to travel again thanks to a university program, and I went to Northern Ireland for 8 months. Then I realized I wanted to stay, to learn english, and continue to work in a 5 star hotels there, which gave me great experience. I understand that this experience gave me much more than university ever could have. I was lucky to find a job in one of the best bars in the world at the Merchant Hotel. At this time, I was working as a chef, but it was a crucial point in my career, because I became breakfast supervisor, and after that, I decided I wanted to stay behind the bar, because I felt it was my place. Since then, I’ve just followed my dream. 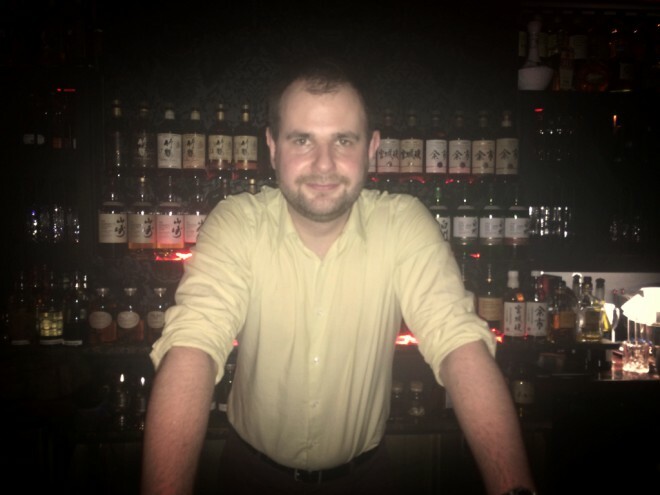 I stayed in Belfast for 5 years, then moved to London to improve myself in the cocktail world. I worked at the Savoy Hotel in the American bar for a year and a half, then I joined this project on Red Bar at Bam Bou where I’ve been for almost 3 years now. So far, it’s been a very very good journey, I don’t look back, only forward. I don’t know, first of all it depends of the location. When I first came to Red Bar it took me 6 months to get to know the locals, who were coming to drink. So my first menu was about adapting it to who was coming in and what kind of drinks they liked. Same for the music, it changed to suit the locals. So it’s difficult. I can imagine myself again in a 5 star hotel with my own bar ideas. A similar size to Red bar, based mostly on regular customers and friends coming back. Something very strongly linked to local businesses. Starting in the day with coffees and sandwiches, then moving into the evening with a nice little party. People should not only enjoy your drinks, but also your company. They need to trust you, because they’re giving you their time. They are guests, then regulars, then friends that you meet outside as well, to explore London together. I can’t tell you the specific concept, but it’s the feeling. I love to get out with my girlfriend and give ourselves a treat at a good cocktail bar like the Connaught or Artesian, or a smaller place like Happiness Forgets. I like to go to establishments where you feel you can do everything there. The idea is to get a nice snack while drinking the best cocktails and listening to good music. A bit of everything in one place. Japanese whisky, but it changed as I grew up. I used to like rum a lot, because of the sweetness and the easiness to drink, then I had a tequila period. I then discovered cognac and finally whiskies from local regions. They are aged and take on the character of the city or the area of the distillery… very sophisticated as a drink and complex. So, why in particular japanese whisky? Because they are driven to perfection, the methodology to create it, it’s perfect from A to Z. Plus, it’s very different and versatile from distillery to distillery. The aromas are different from Chichibu to Suntory Yamasaki, but how they fit your mood is incredible. The real question is who can make a good cocktail? Wherever you are, if the person cares and does it with passion it’s gonna be amazing, because this person can intrigue you with his style and presentation. What matters is the person. The best advice I was given, from Eric who used to work at the Connaught, is : it’s the bartender who makes the bar, not the bar who makes the bartender. The product I want to highlight is Sweet Vermouth, because it helps the character of a drink to be more intriguing. For a long drink I will use Martini Rosso, for a heavier drink with character I’ll go with Punte mes and for something more complex and chocolatey, I’ll go for Cocchi Torino. It just depends on what I am making. So you leave the bar, work half way up Charlotte street, then realise you’ve make a mistake and come back 😉 Happiness Forgets is the place to go, I am always happy there with the service. I like the American bar at the Savoy obviously for many reasons like quality, ambiance, friendships… Artesian is the place where I usually stop in for a drink after work. We have a Czech mafia and we frequently visit each other: Alex in Artesian, Mimi at Hawksmoor in Covent Garden, Eric in the Savoy and Mariam at Nightjar.